To make a positive impact your own financial house must be in order. You can’t save the world if you’re broke. Take the sage advice of flight attendants everywhere and put on your oxygen mask before helping starving children in Africa…or fixing a city…or building a cathedral…or saving the environment…or building a business. Fix your finances first. Take your profit first. And don’t feel guilty about it. This approach isn’t selfish. This approach will ensure that you can apply your energy and talents to the cause that you care about in perpetuity. Does the word “profit” make you uncomfortable? “I’m not in it for the money,” said everyone with a liberal arts education, every democrat, and everyone that actually gives a sh!t…at some point in their life. I said this to myself over and over again, and it was true. The problem was that I had made the mistake of perpetually discounting my financial well-being for my “Purpose.” In my twenties this was easy enough. Now that I am the breadwinner of my family, discounting my financial responsibilities only seems irresponsible rather than altruistic. I had always trusted that if I just threw myself into my purpose, the money would sort itself out. But life doesn’t work like that. 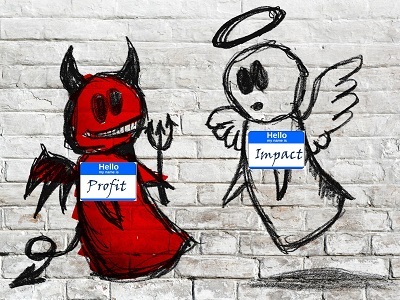 I want to share some of my backstory with you so that I can explain how I arrived at connecting the dots between profit and impact, and decided that it was a message worth voicing. Before the 2016 election I was a scientist at the US Environmental Protection Agency. Needless to say, the new president did not share my beliefs on the value of science and good environmental decision making. I was not going to hold my breath for a new federal contract. After the election, I had to step back and take stock. In the 2000’s I had worked in finance in San Francisco. I developed accounting systems that improved the operations and financial decision making of small businesses. I also strengthened research-based hedge fund investment strategies through modeling and forecasting. At the time, I didn’t think my work in finance applied to my purpose. I didn’t connect the dots between money and impact. So, I went to MIT to get a master’s degree in city planning…to make an impact. Fast forward a decade. The professional shake-up of the election forced me to not only re-evaluate my career trajectory, but also the stories that I had been telling myself about money and impact. I decided to blend my superpowers in finance, decision science, and purpose driven work. In the process, I thought about why finance and money matters. At this juncture I had gained a better perspective. I had experience in private business and entrepreneurship as well as in government. I had experience as a scientist investigating organizations and governments and why they make the decisions that they do. The hard truth of it all: money trumps purpose. On a personal level: I thought about why and how I had avoided paths that might have been more profitable. I thought about how choosing purpose over financial health hindered, rather than helped, my ability to make a positive impact over the long term. I reflected on why I chose these paths – the stories that I told myself and where these stories came from. I realized that many of these stories came from outside of myself. I realized that they are stories that get mangled and misused over time, like a game of telephone. And, I realized that it wasn’t just me that was negatively impacted by these stories. The problem is endemic to purpose-driven work. These are ideas and axioms that are told repeatedly until they are assumed to be true. We let these damaging stories hinder our personal and professional growth because we are terrified of contesting the publicly sanctioned Truth. We are afraid of appearing like jerks. There is a name for stories and axioms that are told repeatedly, and are further and further removed from the truth: myths. 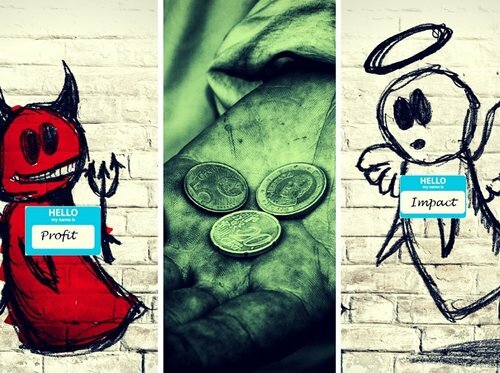 I have identified 6 money myths that will derail your true impact. There are more, but you can consider this your starter kit. Tweet me if you think of more: @hiddenviridian #privatesidepub #myth. I went to college in the early nineties. There were campus protests against companies like Nike for their use of child labor and Bic for their participation in the apartheid in South Africa. Now people protest Trump and Pepsi ads. Profit was evil. And profit is evil when a few people are profiting from the misfortune of others. The profit is evil concept is alive and well because large headless corporations continue to benefit at the expense of the downtrodden. Unfortunately, there is a tendency to forget context and to categorically reject the idea of profit altogether. What this categorical concept neglects to consider is that it is impossible to function in an economic world without profit. When we exchange our labor for money we profit. We use that profit for our benefit – food, shelter, clothes. Without profit, we are destitute. I’m going to make a broad generalization and say that categorical generalizations, in general, are not very helpful. I like to make a habit of scrutinizing them whenever I get the chance. The profit is evil concept becomes dangerous when it makes us dysfunctional within our own careers, organizations, and economy. If you take the concept at face value, it says that making money for your labor is wrong. Have you ever felt guilty about asking for more money for what you do? Have you ever felt that you should be providing your services or doing your job for free? Where does that feeling come from? I want to get at the root of the profit is evil concept. Profit is evil when a company or an individual is hurting other people, or the environment, for their own gain. Profit, in and of itself is not, inherently evil. Hurting other people is evil. Dumping toxins into a river is evil. Making small children work in a sweatshop is evil. When a billionaire does all of this, it makes it especially evil. You making a profit so that you can pay your bills and have a successful business that makes a positive impact on the world is not evil. I hyperlinked this image so as not to violate copyright protection. I love the irony that this is for sale on the internet so that People’s Cube can (I presume) make a profit to support their anti-profit messaging. You may love capitalism or you may hate it. Whatever you think of capitalism, it’s what we have to work with. You can dream all you want about living in the Bahamas, but if your home and your family is in North Dakota, invest in the new winter coat, not the scuba gear. The US (and most other countries) has a capitalist economy. If you whittle your days away dreaming about Marxism you may be able to write an awesome college essay, but you will not make an impact. Rejecting the capitalist system is like throwing away your oars when you are stranded on a raft in the middle of the Pacific. The allure of the handful of leaders that dared to forge a new path is strong. But you have to ask yourself - are you a Karl Marx? Henry Ford? Adam Smith? Vladamir Lenin? Those are big shoes to fill. Step back and figure out what you are really trying to accomplish. Are you trying to convince the world to accept a new economic order? If so, go for it. If not, then fighting capitalism is a red herring, a distraction. More likely, your goals have nothing to do with altering the economic order. What is the impact that you want to make in the world? Do you have a vision for urban mobility, sustainability, or equity? Do you transform people’s perception or behavior through design? Do you help people make sense of the world through communicating complex ideas? You don’t need to reject or reform capitalism to make these types of impact. In fact, rejecting capitalism (unless it is core to your message) will more likely slow you down than speed you up. Stop worrying about the ideology echo chamber and start focusing on your own values and goals. Worry about your impact. Be specific. What are you going to do to make an impact and how? Most people that dedicate their lives to improving the world would do it for free if they could. Unfortunately, when you treat your life’s work as a charity, it tends to backfire eventually. You need to be compensated for the contributions that you make to society. Even if – especially if—those contributions make the world a better place! Most people that pursue purpose drive work will be compensated less than people who work solely for a big paycheck. That’s ok. Payback comes in the form of conscience and fulfillment. You just need to be careful not to convince yourself that your work is so important that you should be sacrificing everything to do it. Otherwise, you will burn yourself out before you even get started. I urge you to get out of the ideological tar pits so that you can figure out what your own personal impact is and pursue it with a vengeance. The only way to do that is to make sure you are taking care of yourself in the process. I promise I’m not going to go on another rant about world economic order, but humor me for just one minute more while I talk about the big C’s – capitalism, communism, contribution, and compensation. I need them for my metaphor. Here’s the thing about living in a capitalist system. You get paid for your work. I visited Cuba in 2005 and again in 2006 and I saw what happens when people aren’t compensated for their work. They get depressed. They fantasize about moving to a country where someone will pay them what they are worth; where someone will value their contribution. Almost everyone that I spoke to had a plan for how to get off the island! This is as much about recognition for one’s contribution as it is about money. I had a computer programmer friend who dedicated his life, his education, his days, to an occupation that was underappreciated. He was miserable, not because he had to work, but because he was highly competent and highly underpaid. He put in long hours and still had to ration food and stand in line to buy black market butter, all the while convinced that he could be making six figures in the U.S.
I’m not trying to trash talk communism. I swear. (My Russian stepmother is way better at that than I am.) What I am trying to do is convince you that you should be getting paid what you are worth, as an individual, or as a business. That worth will change over the course of your career, or as your business matures. Nevertheless, just because you are working for the public good in some way, does not mean you need to run your life or your business as a charity. If you continually underprice your contribution because it benefits the public, you will begin to resent your work. You will feel as if you are living on a communist island. You will turn on the fuzzy banned tv stations from the “evil” country to the North and you will see all the happy people in their pretty houses making money and eating bran flakes and steak. You will begin to fantasize that if you could just get to that glittering shore, you too could make money and buy steak and use real toilet paper. You will devise a plan. You will build your raft. You will abandon your service to the public, your art, your science, your thought leadership, your passion, your impact. You will take a “corporate” job that has nothing to do with your personal impact. You will earn the paycheck that will support your life. And one day you will look back, perhaps nostalgically, perhaps bitterly, at the life you didn’t lead, or couldn’t lead. Get off your communist island now, before it is too late. Work that makes an impact deserves to get paid, and there are two ways. The first is through the market. This is when people are willing to pay you for your services directly. Yay. The second is when there is no direct market for your services, but when your services address a market externality. Externalities are typically funded through the government and philanthropic organizations. Hence, the importance of government and philanthropy. If your service addresses an externality, you need to be well versed in contracting to the government and/or applying for and receiving government and charitable funding. In either case, if your for-profit business is currently being run as a charity, now is the time for some serious revisions.